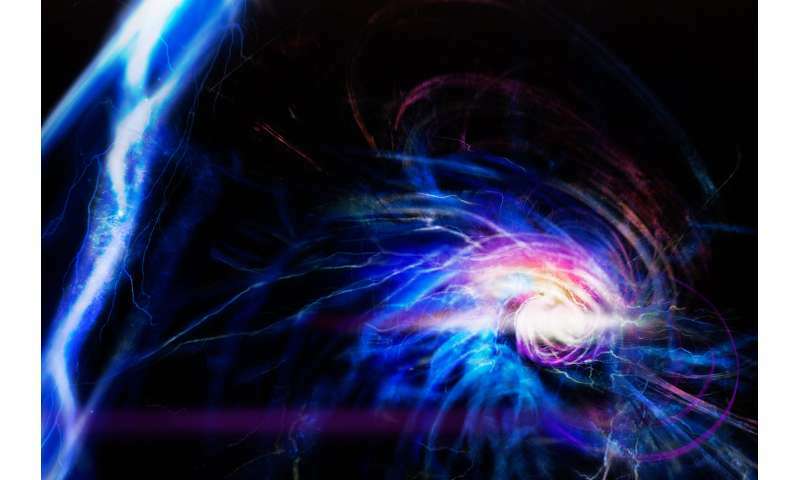 'It is remarkable that we could create the synthetic electromagnetic knot, that is, quantum ball lightning, essentially with just two counter-circulating electric currents. Thus, it may be possible that a natural ball lighting could arise in a normal lightning strike,' says Dr Mikko Möttönen, leader of the theoretical effort at Aalto University. Möttönen also recalls having witnessed a ball lightning briefly glaring in his grandparents' house. Observations of ball lightning have been reported throughout history, but physical evidence is rare. 'The quantum gas is cooled down to a very low temperature where it forms a Bose-Einstein condensate: all atoms in the gas end up in the state of minimum energy. The state does not behave like an ordinary gas anymore but like a single giant atom,' explains Professor David Hall, leader of the experimental effort at Amherst College. 'What makes this a skyrmion rather than a quantum knot is that not only does the spin twist but the quantum phase of the condensate winds repeatedly,' says Hall. 'More research is needed to know whether or not it is also possible to create a real ball lightning with a method of this kind. Further studies could lead to finding a solution to keep plasma together efficiently and enable more stable fusion reactors than we have now,' Möttönen explains. The very existence of ball lightning demonstrates that it is possible to keep a ball of plasma contained for several minutes at least. Without making contact to its container. I have no feeling that this will lead to fusion reactors in my lifetime. But it certainly gives me a very confident feeling that eventually, fusion power will be a reality. Agreed, 50 years ago I arrived at U of W nuclear engineering school and was told that fusion power was "just around the corner." A vortex has no corners. Well gkam. I vaguely remember long-ago cartoons of the Tasmanian Devil Vortex 'cornering' obstacles. Obviously visual proof that EU woo is true! An alliteration a day, is my way to play. am i the only one thinking: sho-ryu-Ken right now :D (street fighter ken & ryu fire ball). but hey, that's what happens when you chose cause over effect. it's magnificent i must say. An electric field with current and no source! This could lead to a new type of weapon, unlimited projectiles! Funny, there's no video or photos of ball lightning. Plenty of high-quality video of asteroid strikes, lightning strikes, and other unusual events, but ever since everyone on the planet started carrying around high-quality cameras, it's like ball lightning stopped happening. You'll have to get out of bed much earlier, so to speak, Ha! Or how about Marauder, US research into to plasma type guns. However, I do agree that if civil research discovers the underlying principles then such weapons would quickly become military hardware. PTTG, I do not understand it but it is real. My father had one come off the right engine of a C-47 while flying gasoline to Gen. Patton's tanks,and bounce around the cockpit before going away in a flash. gkam, the rare, non-alcohol fueled report, including yours, brings a question to mind. I've been a passenger on those old MATS flying outhouses. Transiting storms. The skin of the planes leaked like a sieve. Lightning was visible through the holes in the skin and thundered loudly! Your father's C47 hauling fuel did not explode, obviously. Was there any damage to the control or radio electronics? Cause that is my question. The phenomena known as ball lightning does not act upon materials as electrical discharges I have experienced. For instance, no scorch marks on vegetation or people. No melted puddles of metal, sand, etc. Could Ball Lightning be some phenomena other than electrical? Maybe magnetic but not electrical discharge? Is it possible that the term ball lightning is confusing the evidence, That maybe there is more than one type of visible occurrence? And poor reporting is confusing the multiple realities of these events? I like that question. Could ball 'lightening' be something else like a soliton? I looked up soliton and read 'if magnetic monopoles exist then electric charge must be quantized; as in multiples of a single unit aka hologram. rrw, he told me it formed on the propeller tips and broke loose to come in the right window. It bounced twice or three times and hit the door to the cockpit and broke into a flash. Just percolated up another question. Most reported sightings of phenomena such as ball lightning, St. Elmo's ire and similar events seem to occur in marshes. Cold and damp and the gases produced by rotting vegetation triggering a visual effect different than the electrical static of propeller blades in precipitation at altitude? So the Red Ball Express hauled gas to the planes and then the Red Ball Express then reloaded the gas onto trucks and drove it to the tanks. Just like the Berlin Airlift, right? Patton stopped because the fuel was held north for the British. Patton's movement was stopped by Ike. Or was he carrying hydrazine for the X-15? There was no Red Ball express to serve Patton. The aircraft found the tanks and landed in fields to unload. My god, get a grip. Then look up the 440th Troop Carrier Wing. The pictures of their work in the Battle of the Bulge are in their publication. BTW, there is a C-47 emplaced now on Point du Hoc, with the number 9X under the window. There could not have been more than a few with that number out of the tens of thousands flying then. It was the squadron of my father. ... he told me it formed on the propeller tips and broke loose to come in the right window. It bounced twice or three times and hit the door to the cockpit and broke into a flash. Does anyone know, if during that period, the C-47 cockpit windows were glass. safety-glass, plexi-glass or some other material? Perhaps, as you used to see on cars. A small side-ventilator window was cranked open? Cause, isn't glass an insulator? So if what is believed to have been an electrical discharge? May have been an unrecognized phenomena, with similar characteristics. But could cross through clear glass? For additional read, there's an earlier paper from 2000 by Rañada (cited in this publication) that described this theoretical model.